Enjoy the affordable luxury of dropping off your car and letting us do the rest. Park your car as close as you can, hand your keys in, then walk to the terminal. Valet parking is ideal for guests with a disability. There's no need for transfers you simply drive straight to the airport and let someone else do the work for you. If your actual stay is longer than your booked stay, you will be charged extra on your departure. The extra money will be at the car park's standard daily rate. No refund will be given for part used stays and any additional time will be charged at the local gate rate. As part of the £1bn redevelopment of Manchester Airport we are making some changes to the facilities in and around Terminal 2. These will include some changes to Meet and Greet Car Parking. For departing passengers, the drop-off facility is located on the top level of the T2 multi-storey car park, accessed via the Atlanta Avenue ramp. Once parked, customers should proceed to the new reception facility to drop off their key. 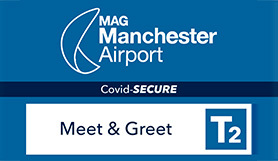 Arriving passengers should collect their key from the M&G reception facility on the ground floor of the T2 multi-storey car park. There is plenty of signage to help you find your way and the postcode remains M90 4ZY. Height restriction: 2 Metres / 6ft 6in. 1. When you reach the entrance to the car park, please press the help button, then quote your car park booking reference number and name to a member of staff. 2. Once you have parked, simply unload your luggage and enter our Meet & Greet reception to deposit your key. Please note we only take receipt of your individual car key. Key rings and other keys cannot be accepted. 3. You will be given a receipt, which you should retain for your return. When you return, visit the Meet & Greet cabin and present your receipt. Your key will be returned and your car will be waiting in one of the Meet & Greet car parking bays.